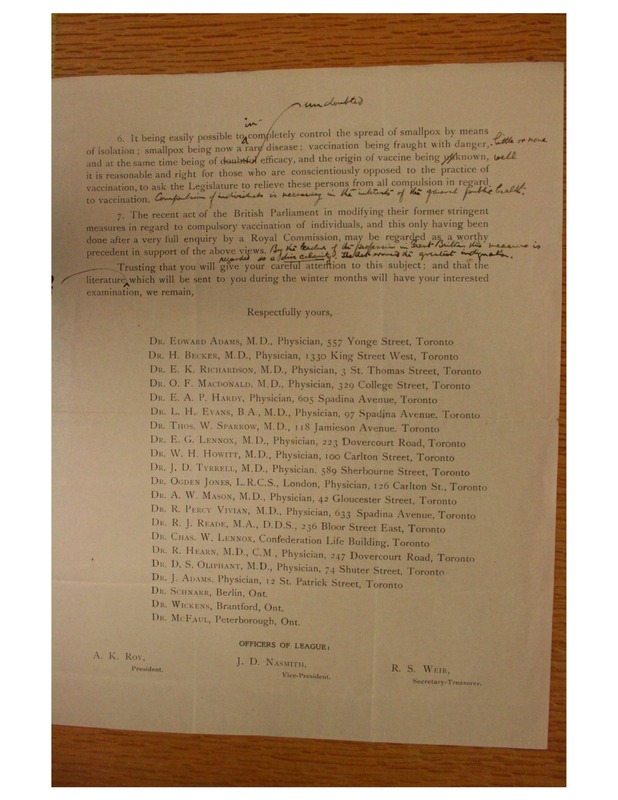 On Dec, 1, 1900, several medical doctors, mainly from Toronto, sent a letter to Sir James Whitney, the 6th Premier of Ontario and conservative MLA representing Dundas at the time, in which they laid out several arguments against compulsory smallpox vaccination laws aimed at preventing unvaccinated students from attending school (see photo below for full text of letter). The letter is interesting for a number of reasons. 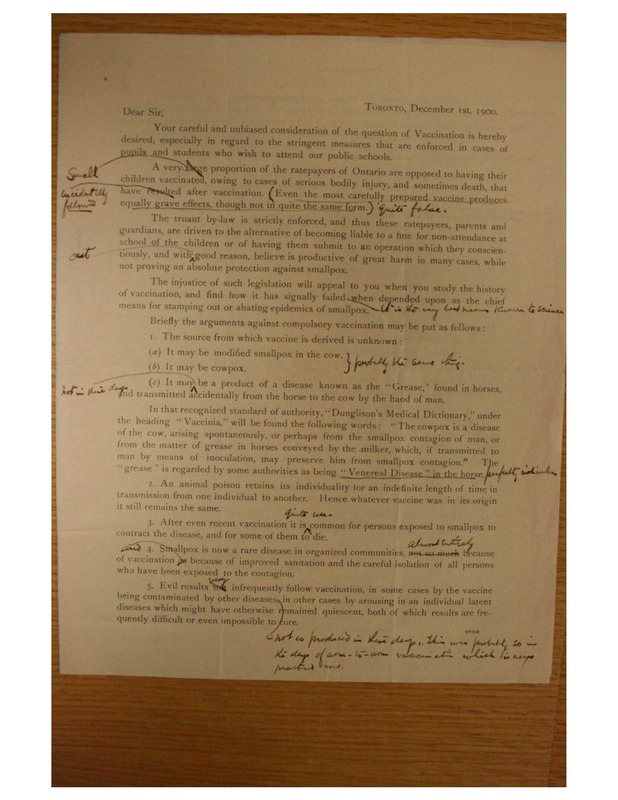 First, it is signed by members of the medical profession, which suggests, contrary to claims that anti-vaccinationism was a fringe movement among illiterate and misguided zealots, that there were anti-vaccinationists within the ranks of the profession at that time. Second, while it is not clear from the letter whether the doctors were acting as a formal group or association, signatories to the letter include three non-doctors identified as “Officers of League.” This suggests that the doctors were members of or that the letter came from the Anti-Vaccination League of Canada. Lastly (this is perhaps the most interesting point), the letter shows Sir Whitney’s apparent disagreement with the contents and arguments, in the form of pen-marked annotations correcting what he felt were false statements in the letter. My own work on legal developments surrounding legal adoption of smallpox vaccination in 19th century Canada suggests that medical professionals employed legal narratives and tried to enlist judicial intervention in this quest for professional status. Statutory rules rewarded the “faith” that doctors had created around the value of their own definition of science (aided by remedies such as vaccination that worked in spite of poor “scientific” understanding regarding its therapeutic value) by allowing them some control over health care and public health affairs, but never enough (at least until the end of the 19th century) to fully displace the orthodox system of health governance, managed by local /municipal officials, or the orthodox system of health care, characterized by a medical marketplace in which all sorts of practitioners provided health care services. I will post some examples in a subsequent post. In 1861, the Province of Canada enacted the first statute to require compulsory vaccination in British North America. Similar to a statute passed by the British Parliament in 1853, the 1861 law mandated the vaccination of infants within three months of birth, and provided for free optional vaccination of others who could not afford the expense of vaccination. However, unlike the British law, the Canadian statute applied only in select cities: Quebec, Three-Rivers, St. Hyacinth, Montreal, Ottawa, Kingston, Toronto, Hamilton, London and Sherbrooke. I am trying to determine what these cities had in common, and welcome comments on this point. My guess is that given how unpopular coercive measures such as mandatory vaccination were at that time (the British law gave birth to the anti-vaccination movement, and measures like flagging of houses where smallpox residents resided were deemed “despotic” and “unnecessary” by pundits during this period), the legislature decided to test the measure in heavily populated areas where outbreaks were more likely to occur. The Province of Canada legislature received petitions to extend the provision of the Act to Sorel and Bonaventure, but an 1863 bill that would have made the law applicable throughout the Province never passed. I find it interesting that the focus of the ban is on the cup rather than the practice itself (although the effect is the same). The wording suggests that regulators were open to measures seemingly less extreme than direct regulation of personal behaviour. After all, nothing in the provision prevents a party of cup-sharing enthusiasts from heading to the woods with a jerrycan of water and a goblet. It is also very interesting, as my colleague Sarah Hamill points out, that religious institutions, which typically engage in sacramental cup-sharing, are not included (at least explicitly) in the list of institutions subject to the ban (or, could they be classified under “public buildings”?). This 1898 monograph, which advocates abandoning germ-ridden sacrament/communion cups in favour of individual cups during communion service, indicates that the communion cup was a primary source of the mischief that the bans sought to prevent. Curiously, the ban still exists in the Charter of the City of Portland. Photo courtesy of the Canadian Public Health Association. I am a big digitization nerd, and I get really excited when I discover new digitization projects and resources, especially ones that make historical research a lot easier and faster. My latest discovery came through my Twitter feed this morning, and is called Connected Histories. The website aggregates eleven digital resources on British history between 1500 and 1900 (including British History Online, London Lives, The Proceedings of the Old Bailey Online) and allows the user to perform a single search of all the aggregated resources. This function is already hugely important and useful, but there’s more. Users can register for a free personal workspace that allows them to save searches and results, and to connect and share resources with others. What I really like about the connection function is that other users can only access the resources you share, and are not able to connect with you personally or even know anything about you other than your username. So, it’s basically a social network for resources without the baggage of personal connections. Brilliant. Connections can be associated with a course, which makes this a useful tool for organizing and distributing course materials. The website also provides comprehensive research guides arranged by topics, such as family history, crime and justice, local history, poverty and poor relief, etc., and detailed information about the included resources. I took the search tool for a quick spin and I am quite impressed with the results interface. Results are categorized by document type, date and availability (free or subscription). Users can also access workspace functions from the results page, including saving or downloading of the searches or results, and Google +1 and Twitter bookmarks. My search results (for the word “vaccination”) also came up with an Old Bailey case that I had not encountered before, which I posted on my brand new HLBNA workspace. I think this project represents the next step in digitization. Digital resources should be more than just a dump for scanned pages, but should provide users with tools for smart, comprehensive searching, saving, downloading, annotating and sharing, as well as helpful research guides. Connected Histories is a not-for-profit service created by a partnership between the University of Hertfordshire, the Institute of Historical Research, University of London, and the University of Sheffield. The subject of today’s post is the first and only reported case on Alberta vaccination laws prior to 1920. The 1915 case is one of a number of cases I have compiled which deal with court challenges presumably initiated by ordinary citizens who were opposed to nineteenth and early twentieth century vaccination laws (similar court challenges were brought against mid-nineteenth century UK compulsory vaccination statutes, but on the basis that penalty provisions in the statutes violated the common law autrefois convict plea). 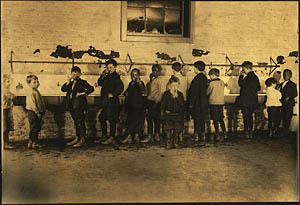 In the present case, plaintiff Clowes challenged a provision in Alberta’s Public Health Regulations of 1911 (enacted pursuant to the 1910 Public Health Act) which stipulates that no person was to be admitted to a school without proof of successful vaccination or of insusceptibility to smallpox, the disease for which vaccination was indicated. The basis for the challenge was that the regulation was subordinate to and in conflict with the Truancy Act, another Alberta statute that mandated compulsory school attendance (one wonders why this conflict was not detected during due diligence prior to enacting the Regulations). Clowes, who I imagine was one of many ordinary citizens who were opposed to vaccination at that time (the case was not reported in the newspapers, and I haven’t been able to find any information about those involved in the case outside of what appears in the law reports), sought an order of mandamus from the Alberta Supreme Court to compel the admittance of his unvaccinated son, Robert Gordon Clowes, to school. The court reluctantly found in his favour. In separate opinions, each of the five sitting justices found that although the regulations were justifiably intended for the prevention of infectious disease and protection of the public’s health, and was much less intrusive than the compulsory infantile vaccination laws that then existed in England, it was nonetheless irreconcilable with the Truancy Act and as such, could not be upheld. Upholding the regulation would amount to repealing the Act or rendering it ineffective. Chief Justice Harvey referenced but distinguished a Minnesota case, State v Zimmerman, where the court upheld an emergency regulation that was similarly in conflict with a state law compelling school attendance. In Zimmerman, the Supreme Court of Minnesota upheld the emergency regulation on the basis that it was enacted pursuant to a statute on the subject of the preservation of public health and prevention of the spread contagious diseases, and being thus a statute “intended and enforced solely for the public good”, must be taken to be “primary and superior” to a statute that protects the right to attend public school. Echoing a common public health refrain, the Zimmerman court declared that as regards the balance required to resolve the conflict between both statutes, “the welfare of the many is superior to that of the few.” However, Chief Justice Harvey distinguished Clowes from Zimmerman on grounds that the regulation in issue was a general one, and not an emergency regulation. 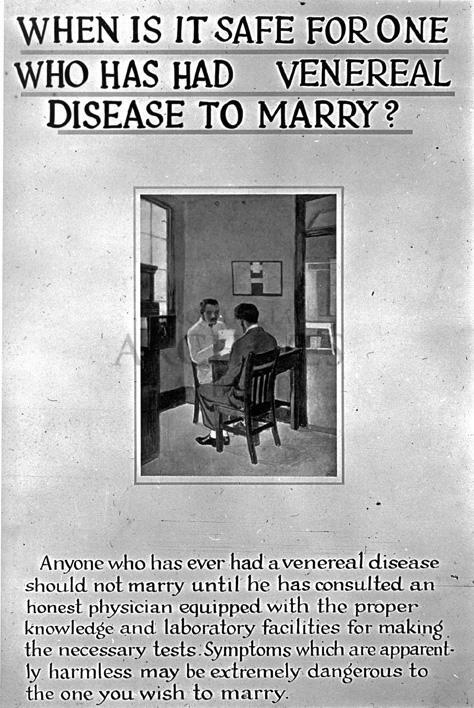 From the Alberta Archives comes this poster counseling persons wishing to get married to first get tested for venereal diseases. The poster appears to be directed at men. 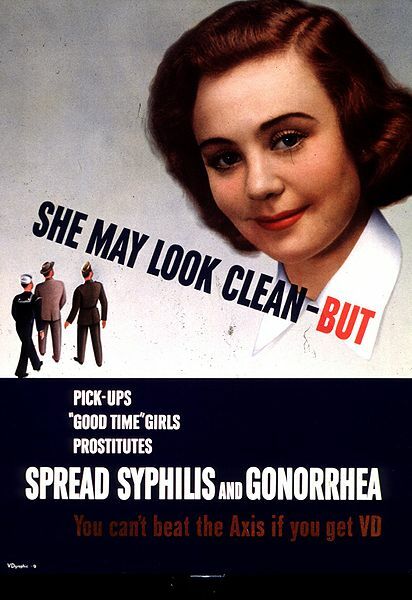 Compare the poster in my earlier post which uses a woman’s image and counsels servicemen to avoid contracting venereal disease from pickups, “good time” girls and prostitutes.